Rabbi Myer Kripke died on April 11, 2014 at the age of 100. May his memory be a blessing. Read the tribute to Rabbi Kripke in the Omaha World Herald. The Kripke Center is dedicated to facilitating scholarly activity in the areas of religion and society. Special attention is given to promoting understanding between and among faith communities, including especially Judaism, Christianity, and Islam. The Kripke Center’s primary audience is the academic community, but its scholarship and services are available to all who seek them. The Center is named in honor of Rabbi Myer and Dorothy Kripke. 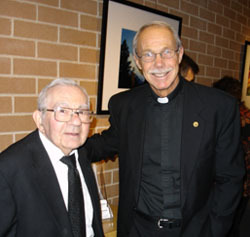 Rabbi Kripke with Fr. John Schlegel, President of Creighton University, at the reception following the dedication of the Kripke Center. Read more about about the Center. Creighton faculty interested in religion and society are invited to become Faculty Associates of the Kripke Center. For more information, see the Faculty Associate Profile. Applications for the Kripke Center Grants are accepted each month. For details, see Research Grants. For more information, go to Center Events. 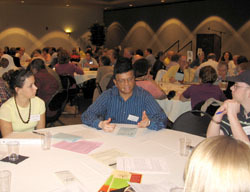 Dialogue at the “Interfaith Dialogue in the Shadow of 9/11” conference, at the fifth anniversary of 9/11.